WHAT’S GOING ON IN THE VINEYARD IN DECEMBER: Lush Green Growth! The canopy management programme is underway with shoot positioning, leaf plucking, trimming and shaping of the vine canopy to direct energy into the fruit instead of foliage. Canopy wires have done their hard work, having helped direct and support the vine growth. Wires will remain at that height. Transpiration rates of water loss through the leaves is also monitored and controlled irrigation applied to maintain efficient leaf function to prevent the vines becoming stressed out. WHAT’S GOING ON IN THE WINERY IN DECEMBER: Making room for next year’s harvest! 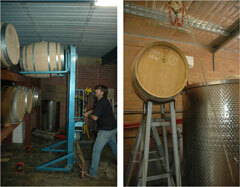 The winery staff is beginning to think about bottling to make room for the next year’s harvest. The Chardonnay will be taken from barrel for the last time and transferred to tank some time during December to be prepared for bottling. The reds are also assessed and transferred to tank to begin preparation for bottling. The exception to this is the Reserves which will be assessed and moved back to barrel to continue development. This is a different style of wine: the very best parcels of fruit are selected and matured in 100% new French oak to achieve wines with immense cellaring potential and complexity. The remainder of the reds are designed to be drunk within five years of production and have now finished barrel maturation: they will however benefit from some time in bottle. In particular tannins will lengthen and soften on the palate and the wine will begin to develop more secondary characters. WHAT’S GOING ON IN THE VINEYARD IN JANUARY: Lush Green Growth! Storms are unusual this time of the year and Hail storms can cause damage to the newly forming berries. The berries are in their rest stage and growth rate slows after several months of intense grapevine activity. Bunch exposure to sunlight is monitored and leaf plucking is performed where more sunlight needs to get through the canopy to the developing berries. By the end of January, regular inspections are being performed on the vineyard to collect samples of berries. The berries are crushed to release the juice and the sugar concentration is measured by a hydrometer (in the lab) or a refractometer (in the vineyard) in units of Degrees Baume or Degrees Brix. The measure of sugar concentration gives a rough idea of the potential alcohol level of the wine, giving a broad guide to the style of wine. Transpiration rates of water loss through the leaves is also monitored and controlled irrigation applied to maintain efficient leaf function to prevent the vines becoming stressed out. WHAT’S GOING ON IN THE WINERY IN JANUARY: Starting to think about Vintage! It is the quiet before the storm… Barrels are being purchased and checked and the winery is getting prepared for the arrival of vintage. Hiring and training of cellar hands begins. There is lots of cleaning and sterilisation taking place in preparation for the big event. 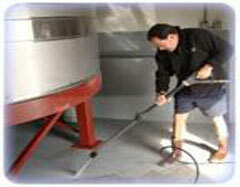 All the equipment has been checked and serviced and is ready for the first grapes to arrive into the winery. This will be the sparkling wine bases. In the background Chardonnay is continually being assessed in stainless steel tanks where it is undergoing cold stabilisation and protein stabilisation in preparation for bottling. Premium reds are also getting prepared for bottling and undergoing fining, blending and filtration. The Reserve wines are still enjoying their stay in barrel until later in the season. For more information on fining agents in wine please see the article at the end of this section. WHAT’S GOING ON IN THE VINEYARDS IN FEBRUARY: Ready to Ripen! The ripening process called veraison starts and Chardonnay is the first to show. Sauvignon Blanc, Semillon, Shiraz and Cabernet Sauvignon will follow. As grapes are ripening, sugar levels rise and flavour, colour and many other compounds develop within the berries as they increase in size. 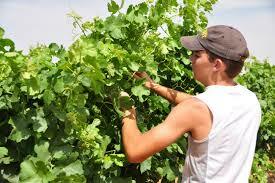 Regular inspections are being performed on the vineyard and samples are being collected and analysed. Nets are deployed onto the Chardonnay in the 3rd – 4th week of February, to prevent birds (mainly the renowned Silver Eyes), damaging bunches by eating whole berries or by pecking at the berries and splitting them. 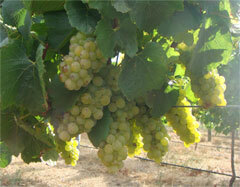 The nets will be moved onto Sauvignon Blanc, Semillon, Shiraz and Cabernet Sauvignon as they each ripen. Berries are softening and increasing in size as they take up water, skin becomes thinner, acidity measurements decrease (Tartaric and Malic Acids), changing colour and developing distinctive aromas and flavours. Acids, aromas and flavours and phenolics are major contributors to the style of any particular wine. The measure of the concentration of acid present in the juice of grape berries is known as Titratable Acidity. How the acids influence chemical reactions in the grape juice is referred to as pH. The Titratable Acidity is decreasing as the pH is increasing during berry ripening. The flavour of the grapes at harvest is important as these characters form a critical part of the style of the wine during winemaking. The grape colours are changing. In white grape varieties, the dark green berries become lighter green or yellow as they ripen. Black grape varieties change from green to red and then to purple-black. Phenolics are found in the skins and seeds of the grape. Anthocyanins are the compounds that give red wine its colour and are only found in the skins of black grapes. The amount of colour in black grapes at harvest partly determines the colour of the wine made from them; light colour produce light colour red wines, intense colour produce darker coloured wines. Tannins are continually changing. Tannins are found in the skin and seeds of black grapes and produce the puckering drying sensations in the mouth when tasting red wines. The amount and types of tannins in the grapes at harvest influence the mouth-feel of the end product. WHAT’S GOING ON IN THE WINERIES IN FEBRUARY: All Geared Up to Go! Picking of Chardonnay can sometimes start as early as late February. Previous red wine vintages also hit the bottling line to make room for the new harvest. Labels are being ordered for wines which will be bottled this month.